The National Archaeological Museum in Skopje gives you a rare opportunity to discover brilliant facts connected with the rich history of Macedonia and see splendid finds that originate from different periods. Before entering the Museum you will notice its splendid architectural style which is recently constructed as part of the project Skopje 2014. 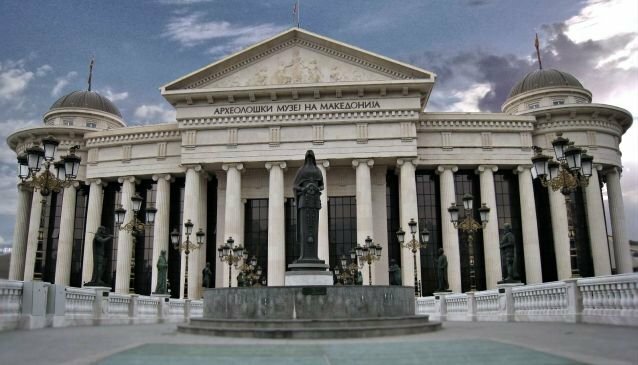 The building is new, with tall columns and huge glass windows which give freshness and unique look to the Museum, also it is connected to the popular Macedonia Square via splendid bridge on which many interesting monuments can be seen. Entering the Museum is like entering in a different world, many artifacts and finds from different parts of the country are gathered in one place. Each of the pieces displayed there has its own story that only shows how rich the past of Macedonia and Macedonian people is. Furthermore, the National Archaeological Museum represents a brilliant cultural place where many exhibitions occur. The Museum is situated in the heart of Skopje, next to the popular Stone Bridge, its perfect location makes it an easily accessible place which is equally visited by both locals and travelers.